October 15, Mathy Vanhoef, postdoctoral security researcher at Leuven University in Europe, disclosed the critical vulnerability of the Wireless Network (Wi-Fi) Protection Protocol standard WPA2 [1,2], which allows attackers listen for Wi-Fi traffic between the computer and the access point within the Wi-Fi range. The vulnerability affects the protocol itself and is valid for WPA and WPA2, so all the software or hardware that supports WPA / WPA2 protocol are affected. 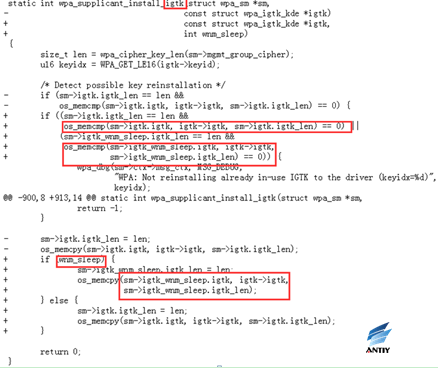 After the disclosure of the vulnerability, engineers from Antiy and Lianshi Networks made a quick response, and analyzed it together to form this report. 4）STA receives GTK, installs PTK and GTK, sends ACK to confirm. AP installs PTK after confirming. Vanhoef named the disclosed vulnerability attack as KRACK (Key Reinstallation Attack), where attackers use the man in the middle (MITM) to attack the third phase of four-way handshake interaction verification of WPA / WPA2 protocol within the Wi-Fi range. At this point the victim has installed a key, after replaying attacks by MITM, it will force victims to use the previous keystream to encrypt data. Since WPA / WPA2 is symmetric encryption, it is possible to obtain reusable keystreams through ciphertext of simple plaintext. The attacker can decrypt Wi-Fi traffic data once the keystream is obtained. The core use of this vulnerability is the key reinstallation, which is based on the four-way handshake process when the connection is established in the WPA / WPA2 protocol. During the four-way handshake, the AP and the client will negotiate an encryption key for encrypting the next communication data, and the client verifies the MIC after receiving the third handshake from the AP (message 3). If the encryption key is installed correctly to encrypt the normal data frame, and send a response to the AP as a confirmation. According to the protocol rules, if the AP can not receive the confirmation correctly, it will cause the data to be retransmitted and resend the message 3. The client will reinstall the same session key each time message 3 is received. An attacker can use this handshake process to send a message 3 in a violent incremental manner, thereby forcing the resetting of the number of incremental packets used by the data privacy protocol and receiving the replay counter, resulting in key reuse. An attacker could replay, decrypt and / or fake a packet in this way. 4) The delay key installation of the group key handshake. Figure 2-3 shows the attacker decrypts a ciphertext packet attack process. If the attacker knows the plaintext of the first transmitted ciphertext packet, the keystream used to encrypt the plaintext data can be recovered. 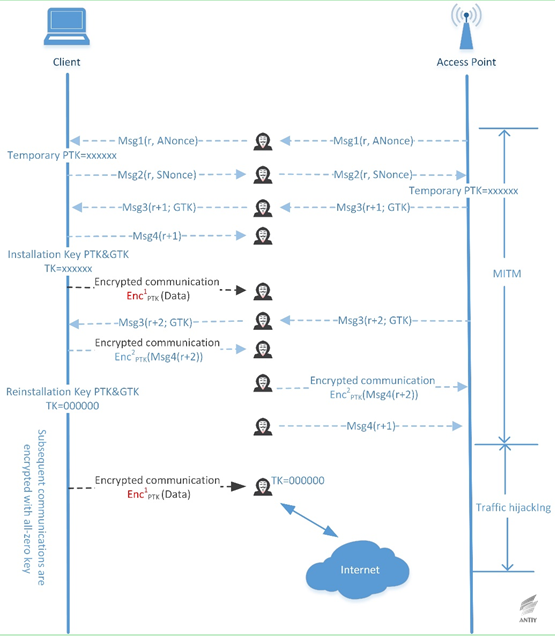 Since the design of the four-way handshake protocol allows PTK and GTK to be reinstalled by retransmitting the message 3 and resetting the nonce value of the packet to be sent, therefore the client will encrypt the next packet with the same key stream, leading to the next ciphertext packet sent by the client decrypted. The above decryption process is based on the premise that the attacker knows the first packet plaintext, but the attacker sometimes can not predict all the field values ​​in the packet (such as a random field that may exist), so the attacker may need to retransmit the message 3 to collect more data for decryption. 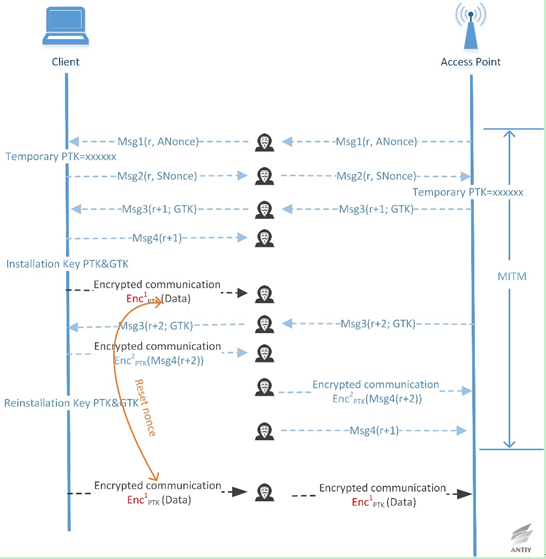 Figure 2-3 shows only the attack process to restore a ciphertext packet, but the attacker can pass multiple retransmissions and select the retransmission time (waiting for the client to send enough data before retransmission), or even force the client to re-execute the four-way handshake protocol to achieve the purpose of decrypting multiple packets through authenticating the client. Since the error implementation of key reinstallation attack after version 2.4 and 2.5 of wpa_supplicant (Android 6 and the above) receives the retransmitted message 3, so that encryption key TK is set to all zero after that. This error greatly simplifies the ciphertext recovery attack, based on the all-zero key, the attacker can decrypt the subsequent packets sent by the client without the need of knowing the plaintext. Considering the above condition, the attacker can achieve the client traffic hijacking, monitoring and tampering all the data sent by the client after forcing it to use all-zero key by MITM. The consequences of the Nonce reuse are closely related to the confidentiality protocol of the data used. The data encryption algorithms adopted by TKIP, CCMP and GCMP are stream cipher RC4, authenticated encryption algorithm AES-CCM and AES-GCM, respectively. 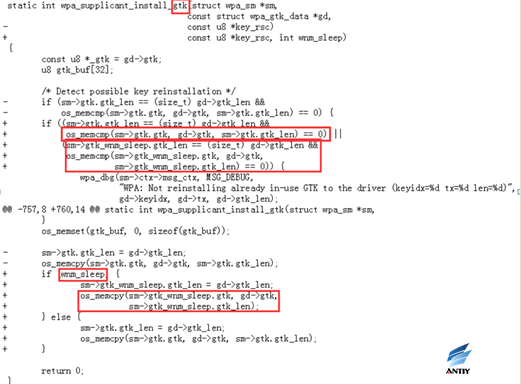 The encryption part of AES-CCM and AES-GCM is based on the stream encryption of CTR mode. It can be considered that all these three protocols adopted stream encryption, that is, the key stream generated by the plaintext data and the algorithm get XOR bit by bit to achieve ciphertext data. The problem with stream encryption is always generating the same keystream when reusing nonce with key-fixed conditions. This feature can be used to decrypt the packet. The encryption process based on the stream cipher RC4 in TKIP is similar with this, so we will not repeat here. In practice, packets with known content can be found usually, so it can be considered that the ciphertext packets can be decrypted according to the above process when reusing nonce in the condition of fixed key. Even if the packets with known content cannot be accessed, it may be decrypted to restore the plaintext in the condition of having enough knowledge of the message type (for instance, the message belongs to English character). It is worth noting that the nonce reuse will cause the ciphertext packets to be decrypted, but it would not lead to the leak of key TK, PTK, PMK and the login password of WiFi. Therefore, the WPA2 password system is only bypassed and has not been breached. The security of block cipher algorithm (AES) itself has ensured the encryption key k cannot be leaked even in the condition of known input and output . The three data encryption protocols of TKIP, CCMP and GCMP also provide data integrity protection except for data confidentiality. However, reusing nonce in different data encryption conditions will bring different levels of security risks in terms of data integrity protection. When using the TKIP protocol, the attacker can further attack the Michael algorithm to access the corresponding MIC key after decrypting the complete TKIP packet (including the MIC field). This is due to the vulnerability of the Michael algorithm itself. In the conditions of given plaintext data and MIC value, the attacker can restore the MIC key. Then the attacker can forge a data frame in the data transmission direction (TKIP uses different MIC keys in different data transmission directions) with the recovered MIC key. When using CCMP protocol, although studies have demonstrated the possibility of data forgery attack in the condition of reusing nonce, the attack is on the theoretical level and difficult to generate real forgery packet in practice, which can only perform replay attacks and packet decryption. The security problem caused by nonce reuse is most serious when using the GCMP protocol. The nonce reuse enables the attacker to recover the authentication key (H) in the GCM mode. Since the GCMP protocol uses the same key for data protection in both directions of the data transmission, this endows the attacker the ability to forge packet in both directions of the data transmission. As a working mode of authentication encryption, the GCM mode is a combination of the CTR encryption algorithm and the GHASH authentication algorithm. The CTR algorithm section encrypts directly by adopting the key k passed to the GCM mode, while the authentication subkey H required for the GHASH operation is the 128-bit ciphertext value obtained by the AES algorithm using the key k to encrypt all 128 bits of all 0 plaintext. The French cryptologist Joux pointed out that the attacker can recover the value of the authentication subkey H (note that the input key of GCM cannot be inferred from the value of H, which is guaranteed by the security of the AES algorithm itself) when reusing nonce. After the attacker gets the value of H, the data integrity provided by GCMP performs practically no function, so the attacker can forge the packet. Overall, the KRACK attack has a significant impact on TKIP and GCMP, and attackers can replay, decrypt, and forge packets. Though the attackers cannot forge CCMP, as long as they can get the serial number, they could hijack the TCP stream and inject the malicious data based on the characteristics of the TCP/IP protocol, which also results in serious consequences. This vulnerability allows adversary to decrypt Wi-Fi flow data, reassemble packet, hijack TCP connections, and inject malicious content into HTTP connections, etc. KRACK attacks are common, which apply to all types of devices that connect or use the Wi-Fi network through WPA/ WPA2. It is effective to personal and corporate networks and any cryptographic kits (WPA-TKIP, AES-CCMP and GCMP), including Android, iOS, Windows, Linux, MacOS, OpenBSD, embedded and Internet of Things (IoT) devices, especially for Android 6 and more advanced versions. Researchers have indicated that it may make a “perfect attack” targeted to wpa_supplicant of Android 6 system client, the attack technology of which is easy to implement. According to mobile security statistics of Antiy, Android 6 accounts for about 41.9% of Android devices. WatchGuard Link Oct., 15, 2017 (Sunday): AP120,320,322,420： 8.3.0-657 version, only cloud model. If the link in the table cannot be opened, you can get it from reference 4. TK should be avoided being reinstall to the driver part in the handshake stage Reassociation-Response, thus to prevent the key reinstallation attack. Tracking the GTK and IGTK currently in use, when a message of the first handshake phase or a WNM-sleep mode response is received (possibly retransmitted), not installing a new key if the key is already in use. This prevents the attacker from cheating the client to reset or change the behavior of the sequence counter associated with the group key. 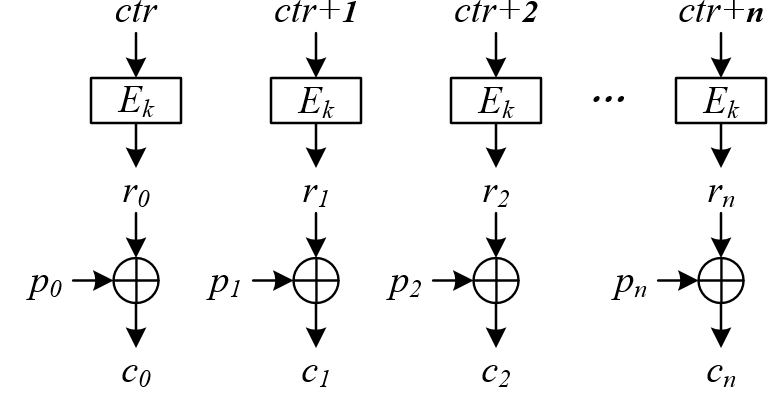 This patch traces the last configured GTK / IGTK value, in conjunction with the EAPOL-Key frame and the WNM-sleep mode frame, because when the GTK / IGTK of these two different mechanisms changes, tracking a single value is not sufficient to detect the possible behavior of the key reconfiguration. Track whether the PTK has been installed to the driver, and TK has been cleared from memory. This prevents the attacker from cheating the client to install all-zero TK. The authorization state machine for PTK rekeying bypasses the authenication2 state while the nonce is generated, and enters the PKT-START state directly, since there is no need to re-confirm the PMK at this time, it may result in nonce not being “random” or other problems. For this problem, when you switch to the PTKSTART state, a new ANonce is generated. When TPK-TK is successfully configured, it is forbidden to reconfigure the same parameters to the drive. If WNM-sleep mode is not already used, the corresponding WNM-sleep mode request is ignored. This avoids unexpected retransmission of data frames. The driver part opens a connection event unless the client explicitly requests a new one. However, reconfiguring the same pair of keys or group keys can lead to nonce reuse problems, so additional checks are required to avoid malicious attacks, including accidental receipt of retransmitted packets due to some environmental factors. KRACK vulnerabilities are mainly used to attack the four-way handshake process of WPA / WPA2. Instead of using AP access point, this kind of attack is against the client. Therefore, it is possible for the user not to update their routers. For ordinary home users, they should pay more attention to the security bulletins from endpoint vendors, and update the configuration or patch, giving priority to update the laptop and smart phones and other clients. The use of the vulnerability did not destroy the cryptosystem itself, what is actually attacked is the implementation process, so this kind of attack can almost bypass all the security monitoring equipment. In a well-implemented network environment, this vulnerability can be used to make foundation for the follow-up attacks through a good implementation of Wi-Fi. It is relatively easy for most WPA2 home and commercial wireless application users to upgrade the client. However, it will have a huge impact on millions of IoT wireless devices that are difficult to update. Please keep vigilant, we will continue to pay attention to the relevant events and make active response. Mathy Vanhoef, Frank Piessens. Key Reinstallation Attacks. Mathy Vanhoef, Frank Piessens. Key Reinstallation Attacks: Forcing Nonce Reuse in WPA2. Antiy is a leading provider of threat detection and defense technology, whose enterprise mission is to enhance users’ ability to deal with cyberspace threats and improve their awareness of threats. Relying on independent advanced core technologies including series products of threat detection engines and experts team, Antiy can provide users with products, solutions and services related to endpoint protection, traffic monitoring, threat intelligence and situational awareness. Antiy has fostered nationwide detection and monitoring capability with our products and services covering multiple countries. With effective combination of techniques and products of both big data analysis and security visualization, Antiy expands the group work competence of engineers and shortens the product response cycle by massive automation sample analysis platform. With years’ continual accumulation of massive security threat knowledge library, Antiy promotes the solution of situational awareness and monitoring and early warning that targets against APT and at scale network and critical infrastructure, combining with the experience of integrated application of big data analysis and security visualization. More than a hundred famous security vendors and IT vendors select Antiy as their partner of detection capability. The antivirus engine of Antiy has provided security protection for nearly a hundred thousand network devices and security devices and more than eight hundred million mobile phones. The mobile detection engine of Antiy was the first Chinses product that won AV-TEST reward in the world, it is the only one whose detection rate is 100% for twice in the Mobile Security Product Test 2015 organized by the international certified authority AV-C. The technical strength of Antiy has been recognized by industry management organizations, customers and partners. Antiy has consecutively been awarded the qualification of national security emergency support unit five times and one of the six of CNNVD first-level support units. Antiy is the significant enterprise node of China emergency response system, which has provided early warning, in-depth analysis or systematic solutions for major security incidents, such as Code Red II, Dvldr, Stuxnet, Bash Shellcode, Sandworm, Equation, White Elephant, WannaCry, etc. Lianshi Networks is an innovative service provider focused on business application security and data security. 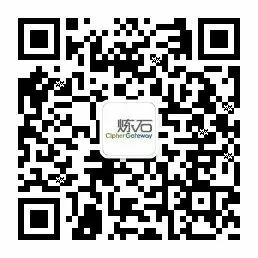 It started the CASB implementation model based on the entrusted security agent technology, and independently developed the CipherGateway service application security gateway, which can integrate the security mechanism (closely related to businesses) to the application system without modifying it. This can nearly build the security capabilities inside for the application, so that enterprises can enrich the application system security features in an unprecedented way, to deal with business application security and data security risks from the start.